“The Pit and The Pendulum” marks yet another collaboration between Dennis Paoli and Stuart Gordon, a combination that proved successful over the years. Just as with “Dagon,” Gordon specifically takes on the directorial role, leaving all of the writing work to Paoli (at least in the credits). This adaptation of Poe’s acclaimed short story is by all accounts a heavily altered version of “Pit and the Pendulum,” and even includes a highly modified version of another Edgar Allan Poe story, “The Cask of Amontillado,” thrown into the middle. Outside of the setting and the eponymous device, this version of the tale is virtually unrecognizable from the original incarnation. In that way, it is somewhat similar to “The Black Cat,” another Poe adaptation Gordon would take on years later. Both concern themselves very little with the source material, which isn’t inherently a bad thing in my opinion. However, I think both films attempt to add in too much extra content, which is something I will get into later. “The Pit and The Pendulum” had a famous film adaptation done in 1961 starring none other than Vincent Price, and was notably directed by B-movie legend Roger Corman. In the years since Gordon’s 1991 take on the story, another adaptation was created in 2009 by yet another B-movie notable: David DeCoteau. However, his version was significantly less well-received, holding an astounding 2.9 rating on IMDb at the time of this writing. 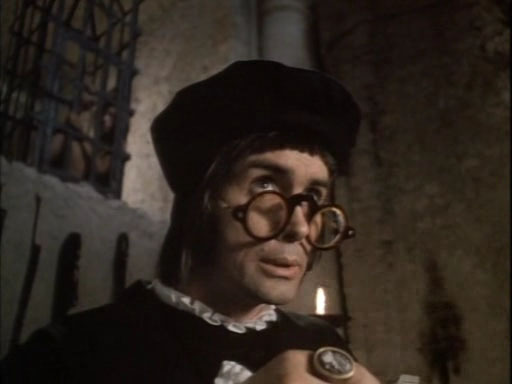 The set and production design of “The Pit and The Pendulum” was provided by Giovanni Natalucci, who worked on a number of previous Stuart Gordon features like “Robot Jox,” “Dolls,” and “From Beyond.” Personally, given the low budget, I think a splendid job was done creating a believable enough set and appearance for the Spanish Inquisition. The cast features a score of recognizable faces for Stuart Gordon fans and general film buffs alike, including Lance Henriksen (“Aliens”), Jeffrey Combs (“Re-Animator,” “From Beyond,” nearly everything by Stuart Gordon), Oliver Reed (“Gladiator,” “Tommy”), Jonathan Fuller (“Castle Freak”), Stephen Lee (“Dolls”), and Mark Margolis (“Breaking Bad”). The story of “The Pit and The Pendulum” follows a young couple in Toledo, Spain during the heat of the Spanish Inquisition. They wind up on the wrong side of Torquemada after an incident in which they attempt to save a young boy from being flogged. From that point, the two try to survive a variety of tortures while Torquemada faces challenges to his reign of terror, both from internal and external sources. 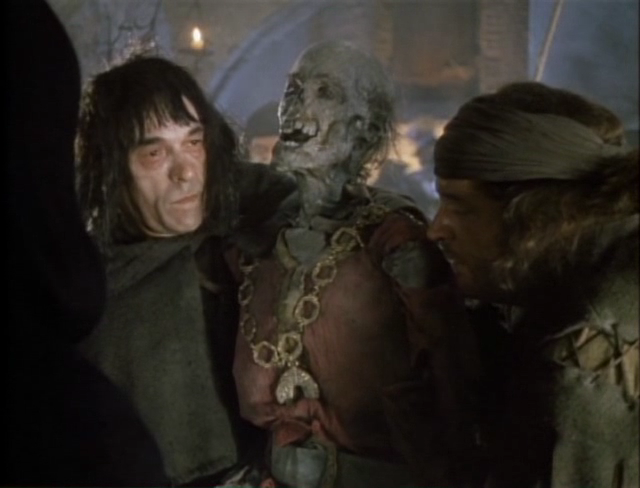 This version of “The Pit and The Pendulum” was apparently the result of the second attempt by Stuart Gordon to adapt the work onto the screen. Apparently, years earlier, Gordon intended to make a movie from the story, but with Billy Dee Williams and Peter O’Toole in key roles. This reminded me a little bit of how “Dagon,” which was initially set to star Jeffrey Combs, got put on the back-burner in favor of “From Beyond,” and wound up staying there for over a decade (meriting a recasting). This adaptation certainly takes a number of liberties with the story of “The Pit and The Pendulum,” but one of the most interesting inclusions was a modified version of the sword of Damocles, an ancient Italian anecdote about the heavy responsibility of leadership, told via the image of a great sword held by a hair above a throne. I thought this worked well here, particularly given the similarities of the images of the hanging sword and the pendulum blade. However, I wish the sword had been used more cleverly and effectively in the story, though it does play in as a plot device. 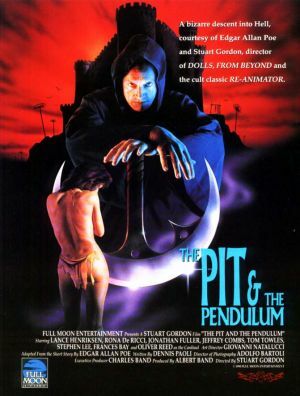 “The Pit and The Pendulum” was released straight to video by Full Moon Features, meaning it never had the opportunity to make money back in theaters. The budget was estimated at a low $2 million, so it probably did well enough to meet production expectations. Given the method of distribution, the film didn’t get a lot of attention. Nevertheless, it currently holds an IMDb rating of 6.2, and Rotten Tomatoes scores of 56% (critic) and 41% (audience). However, I found that those low numbers were a bit deceiving given: of the 9 critic reviews counted, at least one of the ‘rotten’ reviews admitted that the movie wasn’t bad, but was just underwhelming for Stuart Gordon. I agree that this isn’t great for Stuart Gordon, but on its own, it isn’t an awful horror movie. I’d say it justifies the middling score it has accrued on IMDb, but not the significantly lower metrics from Rotten Tomatoes. When it comes to positives about “The Pit and The Pendulum,” I have to start with pointing out the performances. 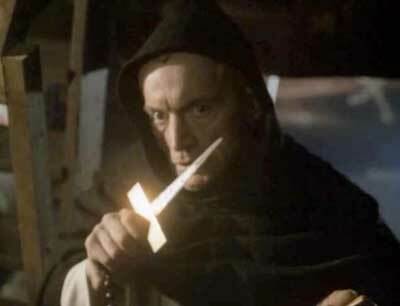 Lance Henriksen always plays a great B-movie bag guy, and his Torquemada is no exception. Jonathan Fuller is also pretty solid as the lead in the story, particularly in a few moments where he laughs off torture attempts to throw off his adversaries. Jeffrey Combs, as always, is fantastic in his minimal background role, and just about steals the show in a couple of moments. That said, in spite of the good performances, I definitely had some issues with this movie. 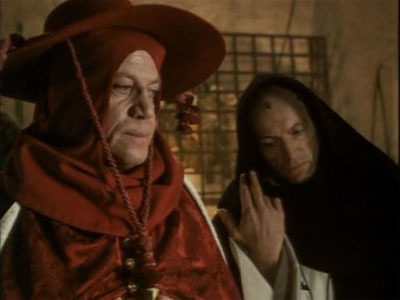 Something about the opening of the film confused me out of the gate: the movie starts with Torquemada ordering the flogging of a long-deceased corpse. It almost plays as physical comedy, watching a dried corpse a la “The Crypt Keeper” being flogged into pieces. I have to assume this was intentional on the part of Paoli, but I don’t understand how this bit of absurdity plays in with the rest of the film tonally. I don’t think anything about this film took me aback as much as the inexplicable inclusion of actual witches, who are shown to be capable of telepathy. I assumed that the inquisitors were wrongfully accusing people of witchcraft, not persecuting an actual subset of witches within the Spanish population. I’m sure there were some Pagans and such in the area in real life, but even real Pagans aren’t actually magic, as the witches are portrayed in this film. I just can’t wrap my head around the logic of their inclusion, outside of providing a handful of minor plot devices to move the story along. It just seemed so astoundingly unnecessary to me: like the old saying goes, “when you hear hoofbeats, think of horses not zebras.” Why on Earth are the people accused of witchcraft in this movie actually witches? It makes more sense for the story that Torquemada is just randomly persecuting people on the slightest whim. Does the fact that these accused witches are actually magic mean that the inane selection process used by Torquemada’s men actually works? I mean, come on. That’s not only outlandish, but it is counter to the entire story. Something else that bothered me about the story (in relation to the inclusion of actual witches in it)is what the ultimate message of it was. It obviously takes a strong stance against Torquemada’s religious violence in the Inquisition, but it is unclear why that is. Maria could be representative of the purer, better form of Christianity, which initially seemed to be the case, but then she developed witchcraft-based telepathy. What are we supposed to make of that? Is witchcraft/paganism the right way to go, as they were wrongfully persecuted by the Christians? Are the Catholics on the right track, as the Vatican attempts to shut Torquemada down? The only thing that is clear at the conclusion is that Torquemada is bad, and everything else is left muddied. Worse yet, one of the great and defining strengths of “The Pit and The Pendulum” was its reality-based sense of terror and dread. This adaptation, with its inclusion of magic, telepathy, witches, etc., managed to turn what should be something realistically suspenseful into a tale that borders on being fantasy-based and generic. Personally, I think that this story would have worked better in a shorter form, similar to the hour-long format of “Masters of Horror.” Paoli clearly struggled to flesh the story out enough for a feature: he wound up making additions that weakened the film, and ultimately inflated the movie just enough to throw the pacing off and void the suspense. To be fair, though, Paoli was tasked with making a lot out of very little, as the short story source material isn’t exactly rife with plot details. For what he had to work with, he did manage to build a narrative around a very narrow tale. Overall, “The Pit and The Pendulum” is entertaining despite its lack of focus and general bizarreness. The performances are all pretty great, and I liked the production design for sure. I feel like the script tried to do a little too much, and the third act just didn’t play as strongly as it should have. The sleep spell (and all of the witchcraft) was beyond out of place here, and Torquemada’s hallucinatory (?) confession scene just didn’t feel satisfying enough. This would have been a more interesting and compelling story without the supernatural elements in it, given that it is never well developed and is just completely unnecessary (or worse, antithetical) to the story. I don’t recommend going out of your way for it, but it is a good enough watch for horror fans. If you happen to stumble across it, there is plenty here to make it worth your time in entertainment. Otherwise, this isn’t a must-find essential entry in Stuart Gordon’s filmography.